Our techs are trained in metal forming and fabrication. 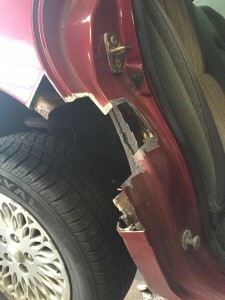 When body shops and inspection stations see a rust hole, they think your vehicle is condemned. We’ve called looking for quotes. They’re not interested. Our philosophy is that a paid off car is worth as much to you as a new car payment is worth to the dealer. If we can buy you 2, 3, or even 4 more years, then you can just pay yourself that premium instead of the bank! It is a deeply rooted belief that the true American dream is to live free….debt free. When a rot hole emerges, it’s almost always a surprise. We specialize in a minimally invasive fabrication technique. Our ability to hand make small patches and repairs saves you time and money. 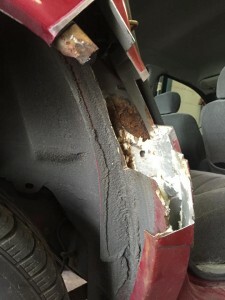 These repairs are very successful and will often last for the rest of the vehicle service life. Of course, we strongly recommend the rest of our preventative products to stave off any further issues. We even give a special discount to customers who upgrade to a full undercoat with their repairs. Gimme Just A Little More Time! Have you ever gone in for an inspection or service and been told your vehicle is too far gone? Surprise! Oh, you don’t have a backup vehicle and haven’t been saving for a new one?! Maybe you should let us have a look and give you a quote. Often times, we know you’re only going to get a couple more years out of it, but the money saved is well worth it. The earth is reclaiming the iron and will eventually win. You’re free falling, and we’re going to give you a parachute, because it’s cheaper to keep’er! 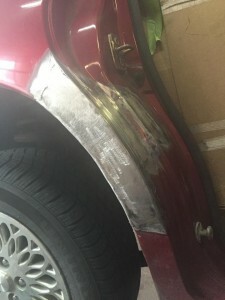 We do some things better than body shops, but paint and body work isn’t one of them. We may be able to help with visible body rust, and we will be completely honest about the quality that we will be able to deliver. So give us a call, and we’ll do our best to help in any way we can.